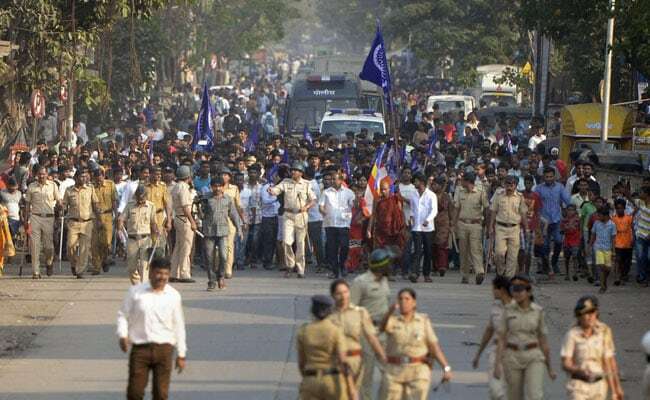 Bhim Army said over 30,000 people are expected to attend the "Bhima Koregaon Sangharsh Mahasabha". Dalit outfit Bhim Army's founder Chandrashekhar Azad alias Ravan is expected to address a rally in Pune on December 30, ahead of the 201 anniversary of the Battle of Bhima Koregaon on January 1. On Wednesday, the organisation said over 30,000 people are expected to attend the "Bhima Koregaon Sangharsh Mahasabha". The rally will be held on SSPMS grounds and besides Mr Azad, several other leaders of the outfit will also be present. Datta Pol, the district president of Bhim Army, said during the three-day programme, Mr Azad will address the rally on December 30 and interact with some students of the Savitribai Phule Pune University (SPPU) the next day. He will visit the memorial at Bhima Koregaon on January 1, Mr Pol said. "On January 1, Azad will first visit the obelisk at Bhima Koregaon and later shower flowers on it from a helicopter," he said. Mr Pol said they had applied to the city and rural police for permission to hold the 'Mahasabha' in Pune and also for the visit to the memorial. "We are confident that we would get permissions... there is no reason for the police to deny permission for the events," he added. Last year, Dalit organisations had organised 'Elgar Parishad' on December 31 at Shaniwarwada in Pune to commemorate the 200 anniversary of Bhima Koregaon battle. Gujarat MLA and Dalit leader Jignesh Mevani, JNU students' leader Umar Khalid, Bharip Bahujan Mahasangh leader Prakash Ambedkar and Bhim Army's Vinay Ratan Singh were among the speakers there. The police claim that the speeches at the conclave had played a role in instigating the violence on January 1 this year, in which one person was killed and several injured. The Pune Police, investigating Maoist links in the Elgar Parishad, in their charge sheet against 10 activists stated that the months-long preparation of the conclave and speeches made during there "aggravated" the violence the next day at Bhima Koregaon.